Once upon a time, Mark Tucker walked away from a perfectly good job in a Seattle law office and moved to a picturesque beach town to pursue his dreams. 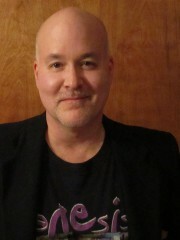 In addition to writing fantasy and science fiction with encouraging success, he is a musician, songwriter, audio producer, and developer of computer games. He fancies himself a low-grade amateur scientist, hunting fossils and keeping current with developments in physics and cosmology, and counts among his dearest moments the first time he found the Andromeda galaxy with his telescope. He enjoys travel, the less scripted the better, and collects representative coffee mugs and Hard Rock Café City Tee shirts from the locales he visits. A collection of African and Polynesian tribal masks adorns the walls of his den. He revels in the beauty and temperament of the Hawaiian islands, and plans to settle on Kauai when circumstances permit.